Gov. Mike Dunleavy took the oath of office shortly before noon on Monday at an impromptu ceremony held in Kotzebue after poor weather prevented his attempt to land in the village of Noorvik. There, he promised big investments in public safety, strides in resource development and, perhaps most importantly, that he wouldn’t be closing any rural schools. “You aren’t going to be an afterthought,” he told the audience after being sworn in. By dumb luck I was the only reporter working for a mainstream outlet in Kotzebue at the time, delayed by the same weather that kept the governor-elect from landing in the hometown of his wife Rose. 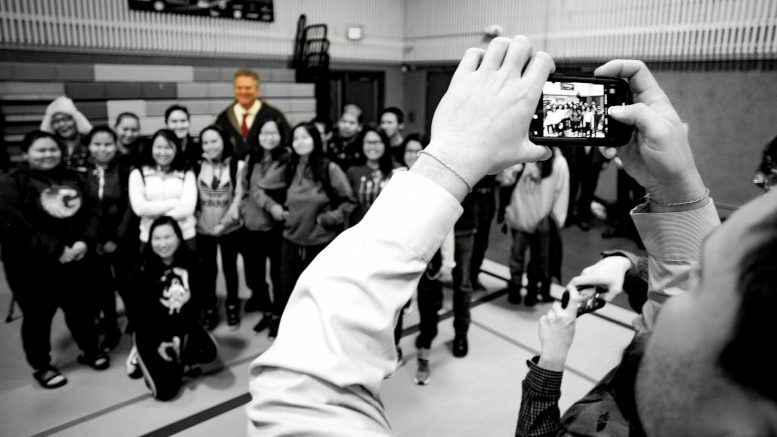 What I witnessed was an uplifting event, putting the Republican’s connections to rural Alaska front-and-center, telling the assembled locals—and high school students—that he heard them, understood them and would be a friend to them. I spoke with a group of young people after his remarks, and a high school sophomore told me she thought it was so remarkable how someone with ties to their community could climb so high. I left with the impression that he does truly and deeply care about the well-being of rural Alaska, but the Dunleavy administration will be so much more than the boisterous celebrations in Kotzebue and Noorvik on Monday. What the new administration does next will either lift rural Alaska or deliver it damaging blows. While Dunleavy was shaking hands with old friends, word was going out that his first round of layoffs resulting from his loyalty-or-you’re-fired letters to non-union employees had started to hit, striking the Office of Public Advocacy particularly hard—including the termination of an employee reportedly critical to a $1 million federal grant for tribal courts. It’s those courts that have made significant strides breaking the cycle of crime and substance abuse in rural Alaska. He believes that resource development can and will be a cure-all for the problems that face Alaska. It’ll bring opportunity for young people because, after all, his eldest daughter works at Red Dog Mine. While that’s great for the people who can land those jobs, not everyone in rural Alaska can or wants to work in resource extraction—particularly when it could come at the cost of the health of their subsistence resources. And what about climate change? Alaska may not be a primary contributor to climate change, but it certainly is on the forefront of feeling its impacts. Just a short walk from where he took his oath of office is Kotzebue’s sea wall, a $34 million project to combat erosion and protect the community from increasingly bad winter storm surges. It’s also where President Barack Obama highlighted the already-real impacts of climate change in the Arctic during his 2015 visit. Climate change made no appearance in Dunleavy’s speech while the climate change website launched under Gov. Bill Walker vanished on Monday and is uncertain to return, and on the campaign trail Dunleavy suggested there are more important things for the state to be worrying about. His pledge on schools is welcome, but it comes with the caveat that he’s still quite interested in pursuing hub high schools—a process that he said on the campaign trail would take up to 10 years to see to fruition (which adds an ominous glint to his pledge that “There will be no schools closed down by myself while I’m governor in rural Alaska”). Those hubs might be optional, but will they be optional forever? Dunleavy’s administration reaches far beyond the 6’7” tall man who displayed so much compassion and so much gratitude to so many on Monday. For every blank in his agenda or “We’re still exploring it” we hear from his team, there’s a partisan in his cabinet who’s been stewing, plotting and campaigning for just this moment. The Department of Health and Social Services, once overseen by Valerie Nurr’araaluk Davidson who spoke so impactfully about triumphing over the adversity of growing up in the village, will be taken over by a person with no health care experience. A budget director who brought home Olympic Gold for Alaska will be replaced with a partisan budget hawk with a penchant for private prisons and no connections to Alaska, let alone rural Alaska. Monday’s firings alone should be worrying, and we still don’t know the full scope or impact that wiping out institutional knowledge will have on the state. We don’t know when state employees can stop worrying about a team scraping the voter registration files and APOC contribution lists and implementing the Dunleavy agenda, whatever that is. The inauguration is a bright point, a promise, a connection to rural Alaska and Alaska as a whole. Are the Dunleavy administration’s promises of aggressive resource development, a criminal justice system that promises “swift and severe consequences” for offenders, and cuts driven by someone with no ties to Alaska the building blocks of a better future? You’d think that such a close connection to rural Alaska might lead one to think otherwise, but I have a feeling something far different is in store. Be the first to comment on "Dunleavy delivered a truly optimistic message to rural Alaska, but it’s what’s next that counts"